SnookySmiles is excited to offer Boutique School Photography especially for Schools, Dance Studios and other Children's groups. Boutique School photography is a new and improved way of creating school portraits that is quickly rising in popularity. The Goal is to focus on each individual child to create images that truly reflect his or her personality. Rather than rushing each child passed the camera assembly line style your photographer will take the extra time need to ensure your child is comfortable in front of the camera and make the experience fun for them. After your child's portrait session the same attention to quality and detail will be given in the editing room so that you will be presented with images of your child that you will be proud to share with friends and family and can cherish for years to come. There are no sitting fees due in advance and there is no cost to the school. Parents will be able to choose and order the images they love best from a private online gallery. No more ordering unseen images before the photo is even taken! 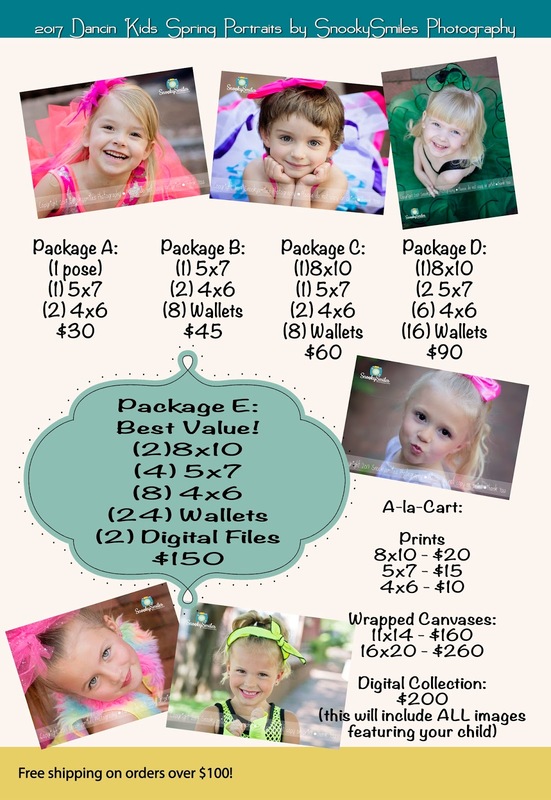 In addition to select schools and preschools in the Lake Norman areas SnookySmiles Photography offers this special pricing for groups such as Dance Classes, Cheerleading Squads, Sports Teams, and Martial Arts Groups. Please contact Melody at Melody@SnookySmiles.com or 704-930-8402 to make arrangements for your organization. Tips for a wonderful Session! Number one and most important… Relax & have fun! We have plenty of time to allow your little one(s) to get comfortable. If you are stressed they can feel it and it will affect them so please remember to be patient and remain calm. This should be fun! Details - I will sometimes take closeups that will include your little ones hands and/or feet. These of course look best if their nails are cut and clean. :) Also, please help me keep a close eye on your child(ren)'s face to be sure dirt, boogers or eye sleepys do not go unnoticed and ruin a great shot. Don't forget to remove those temp arty tattoos!!!!! IMPORTANT: In order to get the most natural expressions from your child(ren) and so have their eyes toward me I like to let them do their own thing as much as possible with minimal instruction. Please, please, please do not prompt them by telling them to "smile!" or "say cheese"
Please Note: Aabsolutely NO cameras at shoot besides mine. It is extremely distracting to both myself and those being photographed. Are you giving away the Gift Certificates again like you did last year? I am! 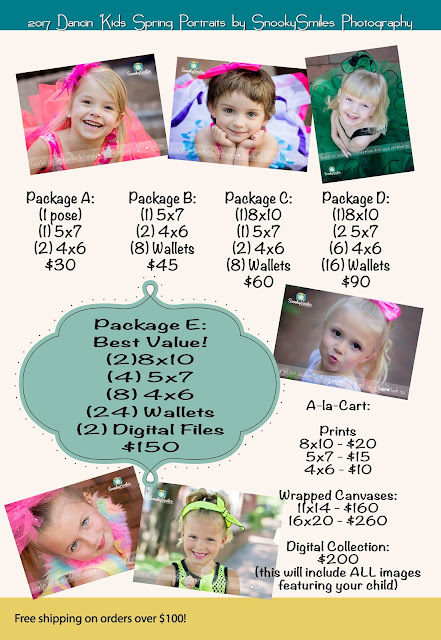 Everyone who purchases a minimum of $100 in portraits (pretax and shipping) will receive a $50 SnookySmiles Photography Gift Certificate to use towards their next Family Photo Session. (Valid only toward private sessions. Not valid for Minis or group events) This year I am also offering FREE SHIPPING on orders over $100. How Much do will the portraits cost? This year I am offering simplified ordering. Prints are $20 each (less than last year) and you will receive a percentage off when you order two or more prints. The more you order the bigger that percentage will be. See new pricing below. Can I get a picture of my children together! My child is good friends with another child in his/her class. Is it possible to get a couple shots of the two of them together? Last year my child did not get the same poses as her classmates. Why not? The canned cookie cutter experience is something I pride myself in NOT doing as a custom photographer. Each child is different and special and should be treated so. However, I am thrilled to accommodate and be sure to include any special pose you would like. Please take a moment to browse through last years dance pics HERE and HERE prior to your child's session and make note of any particular poses that you (or they) love so we can be sure to incorporate it into their session. There is no Session Fee for your child's Session and you will not be required to submit your order until you get to see your images! Unlike some other studios you get to select which images you love rather than simply receiving what the photographer selects. Within 2-3 weeks of your child's session you will receive a link to your online gallery of 3-5 post-session custom images to choose from prepared with detailed attention to each image. This gallery will be hosted for 10 days. Please note that your order must be received during this time and you can place your order right online. Can I schedule a Family session? YES! Of course! Email me at Melody@snookysmiles.com or call my cell 704-930-8402 and we can coordinate a date! DIGITAL COLLECTION: The Dancin Kids Digital Collection includes ALL images your child is in including their group shots as well as individuals. You will receive full resolution files of all your images along with the rights to print without limits on size or quantity.